I have now spent three weeks trying and failing to do a technique called a Western Blot. It’s a pretty neat procedure where you can take all the protein in a sample, separate out all the proteins by their size, then mark certain proteins. It’s a way of visualizing protein X on a piece of paper (well, membrane) that approximates how much of protein X is in your organism (or system). Orientation/Explanation of that image: the numbers on the left tell you the size of the protein (see, biggest on the top, smaller further down). kDa means kilodaltons, and it’s a unit of size (or mass). The lefthand column of the blot is a protein ladder. This is a known mixture of proteins of known size that orient you to the approximate size of your protein. The top, larger box is the experimental blot: this is the one with your actual results. The bottom, smaller box is the control. If you look at the row of blobs on the top, you see that there’s a dark blob (=lots that protein Bcl-xL) in the second column, and very faint blobs (=very little Bcl-xL) in the third and fourth columns. If you look at the very bottom of the picture, there’s a line with – and +. This tells you whether or not this thing called siRNA was added (+ means it was added, – means it was not). 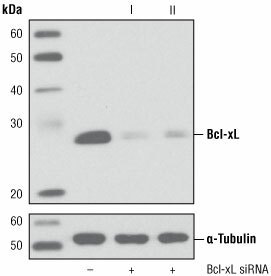 In the simplest terms, siRNA blocks production of a specific protein (in this case Bcl-xL). So, as you would expect, when you add siRNA, you get very little of the protein! The bottom box is just the control to show that the lighter blobs weren’t just because the researchers accidentally added very little sample, based on the fact that a different protein (which should not be influenced by the siRNA) was present in the same amounts every time. I’m trying to do basically the same thing: perform a western blot for my protein to confirm whether or not my morpholino (which, for our intents and purposes, does about the same thing siRNA does: prevent protein production) worked! This is along the vein I was talking about last week: it’s a control to convince you that any results I get are actually from my manipulations, and not a fluke or due to some other factor. Because if my western blot shows that my morpholino didn’t decrease protein levels, then I would have to conclude that 1) something is wrong with my morpholino or with how I’m using it and/or 2) any effects on the neurons are not due to the reduction of my protien, but are instead due to something else I’m doing. Okay, so I’ve been trying (and failing) to get a western blot to work for weeks now. And when I say my western blots are failing, I don’t mean that I’m not seeing reduction of my protein or my blot isn’t showing the results I expect (those would mean either my morpholino likely isn’t working or my hypothesis is wrong). I mean that my blots aren’t showing anything at all. No bands at all except for the protein ladder. 1) Dissect out dorsal sections (the backs) of frog embryos. 2) Break open the cells and separate out the majority of the protein from other stuff in the cells. 3) Denature (unwind) the proteins. This gives them a negative charge. So I can now pull them through a gel by having a positive charge on one end and negative on the other, so they get attracted down the length of the gel. Because the gel resists the movement of the proteins, they end up getting separated by size (the biggest proteins move the slowest, and therefore stay at the top of the gel). 4) Transfer the proteins from the gel to a membrane (again using charge to move them over). 5) Staining certain proteins with antibodies (conceptually very similar to immunocytochemistry). I put on antibodies that bind specifically to the protein I want to visualize, and then add chemicals that allow me to visually see where on the membrane that protein is. Now, at every single one of those steps, one (or ten) things could be going wrong. And western blots are notoriously obnoxious for this reason. There are a ton of steps (the real protocol [read: recipe] I’m following has 35 steps). And each of those steps can be tweaked slightly (maybe one person uses ethanol instead of methanol; there are several ways to break up your proteins; there are lots of options for which antibodies to use to probe for your protein). So it’s very difficult to pinpoint where my problem is. Which is extremely frustrating when the whole process takes about 10-15 hours each time, and I don’t know for sure if it worked until the very end. There are a couple of ways I can find out if everything has at least worked up to a certain point (there are chemicals that will stain all the protein, so I will be able to tell whether any protein is actually present on the membrane at all). So slowly, but surely, I can narrow down my problems. But it could take awhile. And this is one reason research is expensive and takes a long time: oftentimes things are just very tricky or very complicated. Advancing technology makes things easier (western blots are much easier and faster than they were a few decades ago). But of course then you have the time and capability to do more, so we get more ambitious. At one time, a good western blot plus a handful of other experiments were worthy of a publication. Now they often show up in papers as footnote controls to bolster the other, much more major, experiments. So I’ll probably be spending several more weeks getting this to work. I’m meeting with a grad student next week who does western blots all the time, and she should be able to help me further narrow down my problems, so I’m looking forward to that. Also one somewhat unrelated note: as much as I’d love to explain exactly what I’m doing, I have to withhold some information. You’ve probably heard the term “publish or perish”. And a lot of publications will not allow data to be published if it has been published anywhere else (including online in a blog like this). In addition, there’s a risk that another researcher somewhere would stumble upon my blog and see what I’m doing and think, “Hey, that’s a good idea, I’ll do that really quickly and publish on it!” And another frequent requirement from publishers is that the research is novel, so if somebody already has a paper on that (even if they stole the idea from me), I wouldn’t be able to publish. And as much as I hate this culture of secrecy and publishing games, revealing too many specifics here could seriously hurt my research and my career. So unfortunately I don’t think I’ll be able to tell you about the specific protein I’m working on right now (I’ll just call it “my protein”). But the protocols I’m using are pretty universal, and that really gives you a good idea of what I’m actually physically doing in lab, even if some of the intellectual puzzle pieces are missing. *for anyone curious, Bcl-xL is part of the Bcl-2 protein family (a protein family is just a categorization method by which we group proteins with similar structures and functions into families). This protein family is important in regulating a process called “programmed cell death” or “apoptosis”. This type of cell death is actually really important because it’s a method by which cells can determine when something is very wrong (major DNA damage, viral infection, etc) and destroy themselves in a way that prevents other cells from getting damaged, too. But the process is also a part of normal growth and development: it’s how you have unwebbed fingers and toes! When your hands are developing, they’re actually webbed, and eventually all the cells in between what will become your fingers go through programmed cell death! I’ve been in science and thinking about science for long enough that there are a lot of concepts and terms that are second nature to me that are completely foreign to most of the public (a friend recently brought up the word “assay” as an example of this: I use it all the time and it has a specific meaning, but for the general public it’s a less common word that’s sort of just synonymous with “experiment” or “test”. Or it has a slightly different industry-specific meaning). But today I want to talk about controls. This may be really basic, but I just want to get everyone on the same page quickly. If you change a variable in an experiment, it means nothing if you don’t have a baseline to compare to. Say we want to study the effect of drug A on patients. To figure out what effects drug A has, we have to have another group of patients who get a control, which will be our baseline with which we can compare drug A patients. And again, this may be basic, but bear with me. No drug is a terrible control. That’s why we use placebos. To separate out the effects of the act of giving someone a pill, any pill, and the effect of drug A itself. Controls are some of the most important parts of an experiment because they are what determine how your data can or should be interpreted. And many experiments, especially as they become more complicated, actually need multiple controls. You need to confirm not only whether or not your experimental condition had an effect, but also whether that effect caused by what you think it was, and whether your experimental condition was actually present in the first place. And we talk a lot about controls in grad school and classes and science in general (that’s often the quickest critique of published research is what controls they did and whether those were sufficient to reasonably believe the authors’ conclusions). But there’s one aspect that I think doesn’t get talked about enough, which is verification of results via other methods. Whenever you have a question in science, there are typically several ways of approaching it to try to get an answer. And too often (not all the time, but too often), not enough approaches are taken. Unfortunately, repeating research isn’t rewarded in science (it’s difficult to publish and impossible to get a grant for, so there’s very little incentive to confirm previous findings). So how does this apply to me? I’m currently working on one experiment, but it has three parts. I’ve mentioned before that I’m injecting frog embryos with a morpholino (which prevents production of a certain protein). So I end up with embryos that haven’t made enough of the protein during development. And of course I have a control which was injected with a morpholino that doesn’t have a target (so I know that any effect I see isn’t simply because of the physical injection itself). But the other two parts are actually verifying that my morpholino did what it was supposed to in the first place. I mentioned immunocytochemistry in my post two weeks ago, and that’s one approach. If I successfully prevented protein production, I would expect to see less fluorescence in neurons from my target protein morpholino embryos than from the control morpholino embryos. And I’m also doing a technique called a Western Blot to look at the relative concentrations of my target protein in each group. If both approaches agree, then I can be quite confident that my morpholino really did work, which increases the chances that any difference I see between my experimental and control embryos are actually due to the lack of the target protein in the experimental embryos. But if they disagree, then I might have a problem (or I might not). But it means I need to go back and look at my experiment to figure out why these two different approaches are telling me different things. Similarly, to be confident in our scientific conclusions, it’s also good to approach the same larger problem from a few directions. So once I am confident that my morpholino is having an effect, I’m going to try another method of reducing this protein. Instead of preventing the production of the protein, I’m going to use another technique that will break this protein after it’s made to prevent it from doing it’s job. If both approaches agree, I can be very confident that this protein is necessary for the neuron to do X (where X is the function that breaks or changes when I get rid of the protein). But this weekend is our second recruiting weekend! Also known as interview weekend, this is basically when all the prospective students come and interview and hang out with current students and get wined and dined and decide if they want to go here, and we decide if we want to accept them. By this stage in the grad school application process, you’ve submitted all your transcripts, letters of recommendation, personal statements and research experience essays, and all that jazz. The program has decided that on paper, you’re qualified. So recruiting weekend basically is a time for the program to make sure they didn’t make a terrible mistake (i.e. you lied on your application or you really don’t fit with the culture of the program), but it’s also time for them to try to convince you that you should definitely, totally come to our amazing school. It ends up being pretty fun (definitely fun as a first year, but still fun as a recruit, too). Even the interviews aren’t so bad because most PIs (who are doing the interviewing) are not interested in grilling you. They just want to talk a bit about what you’ve done (because it’s probably pretty cool, and if there’s one thing scientists love, it’s hearing about other science in the world). I remember my interview weekends actually having a good time during the interviews. It’s sort of intense because you get shuttled to 6 half hour interviews over the course of a morning and afternoon. And you may be slightly jet-lagged from having flown in the night before. But it’s fun to talk about what you’ve done, and to hear about what PIs at this university are doing. I ended up rotating with two PIs I had interviewed with, and joined the lab of one of them.